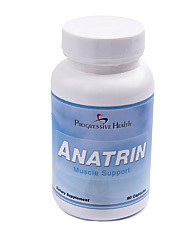 Anatrin is designed to provide energy while also helping to reduce pain and fatigue. Fibromyalgia is commonly diagnosed as widespread musculoskeletal pain for a period of three months in all four quadrants of the body, accompanied by tenderness at 11-18 specific points in the body. Anatrin may be helpful with reducing pain associated with Fibromyalgia while also helping with signs of fatigue. According to the American College of Rheumatology, Fibromyalgia affects 2% of the population. While it is not fully understood, some symptoms include aching, fatigue, lack of sleep, morning stiffness, headaches, and depression. Anatrin is designed to provide energy while also helping to reduce pain and fatigue. The active ingredients have been clinically shown to help ease pain while also supplementing vitamins and minerals that are commonly found to be deficient in those with Fibromyalgia.